Telma Louise Hopkins (born October 28, 1948) is an American singer and actress. Hopkins rose to prominence as a member of the 1970s pop music group Tony Orlando and Dawn, which had several number one songs. She also performed on the CBS variety show Tony Orlando and Dawn from 1974 until 1976 along with Tony Orlando and Joyce Vincent Wilson. In the late 1970s, Hopkins began working as an actress, playing roles on various sitcoms, including Isabelle Hammond on Bosom Buddies (1980–82), Adelaide "Addy" Wilson on Gimme a Break! (1983–87) and Family Matters (1989–1997) as Rachel Baines–Crawford. As lead actress, Hopkins starred on Getting By from 1993 to 1994. In recent years, Hopkins was a regular cast member on Half & Half (2002–06) portraying Phyllis Thorne, Are We There Yet? (2010–13), and short-lived Partners (2014). In film, Hopkins co-starred in 1984 science fiction film Trancers and in its sequels Trancers II (1991) and Trancers III (1992), and well as appearing in The Wood (1999) and The Love Guru (2008). Hopkins (left) with Tony Orlando and Dawn, 1974. Hopkins started her career as a background singer in Detroit, Michigan, singing on many of the Golden World and Motown hits and working with legendary acts like The Four Tops and Marvin Gaye. She also sang back up for Isaac Hayes and can be heard famously exclaiming "Shut your mouth!" on Hayes' hit song "Theme from Shaft”. In 1971, Hopkins and Joyce Vincent Wilson were recruited by Tony Orlando to form the vocal group Dawn. (Orlando had released the singles "Candida" and "Knock Three Times", recorded with session vocalists Linda November and Toni Wine backing him, under the name Dawn; when the singles charted, Orlando found himself needing to assemble an actual backing group to tour and record with. As a recording act, Tony Orlando and Dawn would have much success throughout the second half of the 1970s, releasing 16 top-40 singles, three of which reached #1, and starring in a CBS variety show (entitled Tony Orlando and Dawn) from 1974-76. In 1977, Tony Orlando and Dawn announced their retirement. In 1979, Hopkins made her acting debut playing Daisy in the ABC miniseries Roots: The Next Generations. Later that year, she co-starred alongside Eileen Brennan on the short-lived ABC sitcom A New Kind of Family. The following year, she was cast opposite Tom Hanks and Peter Scolari in another ABC sitcom, Bosom Buddies. The series was cancelled in 1982 after two seasons. She also guest-starred on The Love Boat, Fantasy Island and The New Odd Couple during early 1980s. In 1983, Hopkins joined the cast of NBC sitcom Gimme a Break! starring Nell Carter. She played Adelaide "Addy" Wilson, Nell's childhood friend, until the finale of the series in 1987. In 1989, Hopkins began starring as Rachel Baines-Crawford in the ABC sitcom Family Matters. She left the series after four seasons as a regular cast member, making guest appearances in later years to its last season in 1997. She left Family Matters to star as the co-lead (with Cindy Williams) of the sitcom Getting By which aired for two seasons (one on ABC, the other on NBC) from 1993-94. Hopkins also has had number of supporting film roles. She played Engineer Ruth "Ruthie" Raines in the science fiction film Trancers (1984) starring Tim Thomerson and Helen Hunt, and its sequels Trancers II (1991) and Trancers III (1992). In later years, she appeared as Richard T. Jones' mother in the romantic comedy The Wood (1999), and played Romany Malco's mother in the comedy film The Love Guru (2008). She appeared onstage[where?] in JD Lawrence's The Clean Up Woman in October 2008. From 2002-06, she starred in the UPN sitcom Half & Half alongside Rachel True, Essence Atkins and Valarie Pettiford. She had the recurring roles on The Hughleys and Any Day Now. From 2010 to 2013, she co-starred alongside Terry Crews and Essence Atkins in the TBS sitcom Are We There Yet?. In 2014, she played Martin Lawrence's mother on the FX sitcom Partners. In 2016, she was cast as Jerrika Hinton' mother in the ABC comedy pilot Toast produced by ShondaLand. Born in Louisville, Kentucky,, Hopkins was raised in Highland Park, Michigan. Hopkins has been married once to Donald B. Allen from 1970 until 1977. Together, they have a son. Hopkins often volunteers her time for charitable causes. She has worked with Caring For Babies with AIDS, Act on Arthritis, and the PTA. She also mentors children. Hopkins remains a huge supporter of inspirational radio and granted permission for The Jazz Joy and Roy radio show to use her supportive remarks on the program's promos. Hopkins said to Jazz Joy and Roy, "I was raised by a grandmother who told me I could do whatever I wanted to do, as long as I was willing to work hard for it...."
1979 Marie K.C. Jones Episode: "Pilot"
1982–1983 The New Odd Couple Frances Episodes: "Frances Moves In" and "Oscar Dates Felix's Frances"
1984 Fantasy Island Doris Wilson Episode: "Bojangles and the Dancer/Deuces Are Wild"
1988 Amen Charlotte Holloway Episode: "Wedding Bell Blues"
1995 Women of the House Officer Rhoda Episode: "The Conjugal Cottage"
1997 The Nanny Lila Baker Episode: "Fran's Roots"
1998 ER Carlene Episode: "Think Warm Thoughts"
2000 Suddenly Susan Denise Episode: "The Reversal"
2001 For Your Love Miss Hope Episode: "The Next Best Thing"
2008 Psych Phylis Gaffney Episode: "There's Something About Mira"
2013 Getting On Beverly Raymes Episode: "Born on the Fourth of July"
2015 K.C. Undercover Miss Holley Episode: "Debutante Baller"
2016 2 Broke Girls Pilar Episode: "And the Rom-Commie"
^ a b McCann, Bob. "Encyclopedia of African American Actresses in Film and Television". Google Books. Retrieved 2018-06-11. ^ a b Steve Huey. "Dawn". AllMusic. Retrieved 13 April 2016. ^ "Losing Job Was Her Best Break Telma Hopkins Has Made The Switch From Singer To Actress". philly-archives. Retrieved April 13, 2016. ^ a b c "WITH AN EYE ON ... : Telma Hopkins, the accidental actress with a message to tell". Los Angeles Times. Retrieved 13 April 2016. ^ Karlayne Parker (2008-07-27). "Baltimoresun.com". Weblogs.baltimoresun.com. Archived from the original on December 26, 2008. Retrieved 2009-07-15. ^ "Are We There Yet?". canceled TV shows - TV Series Finale. Retrieved April 13, 2016. ^ Lesley Goldberg (December 16, 2013). "Telma Hopkins Set as Martin Lawrence's Mother in FX Comedy (Exclusive)". The Hollywood Reporter. Retrieved April 13, 2016. ^ "EW Community". EW.com. Retrieved April 13, 2016. ^ Megan Schaefer. "'Grey's Anatomy' Cast Reunites In Set Photo From New Shonda Rhimes Comedy 'Toast'". International Business Times. Retrieved April 13, 2016. 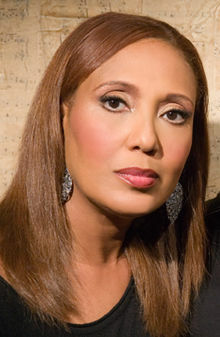 ^ "Telma Hopkins Biography". Retrieved April 13, 2016. ^ "Kellie.de". Kellie.de. 2003-11-12. Retrieved 2009-07-15.